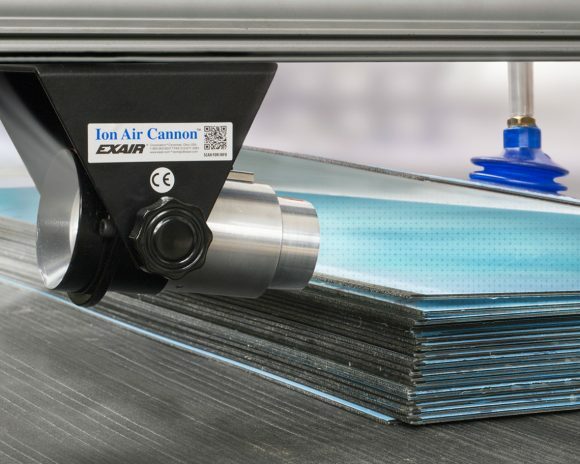 EXAIR’s new Ion Air Cannon eliminates static electricity and cleans at distances up to 15 feet, with no moving parts. It is ideal for bench-tops, machine mounting, and those “hard to reach” spaces that require a concentrated flow of static eliminating ions. This engineered product has undergone independent laboratory tests to certify it meets the rigorous safety, health and environmental standards of the USA, European Union and Canada that are required to attain the CE and UL marks. It is also RoHS compliant. New design features include a metal armored high voltage cable to protect against abrasion and cuts, a replaceable emitter point, integrated ground connection and electromagnetic shielding. The Ion Air Cannon incorporates EXAIR’s patented Super Air Amplifier that minimizes compressed air use by inducing surrounding airflow at a ratio of 22:1. The unique amplified airflow carries the ions to the target, making it possible for the Ion Air Cannon to eliminate static charges in less than a half second. Air volume and velocity are infinitely controllable from a “breeze” to a “blast” to gently wipe or forcefully blow away contaminants. The Ion Air Cannon comes complete with a sturdy stand that incorporates a swivel adjustment for directing the airflow. A hose or tube can be easily connected to the air intake to draw air from another area. The electrical ion source is shockless and there is no radioactive element. A new selectable voltage power supply has been designed to operate the Ion Air Cannon. Visit EXAIR.com to see the entire static elimination product line. Applications include bag opening, sheet separation, cleaning molded parts, pre-paint dust removal, package cleaning and container neutralization. Price is $588.